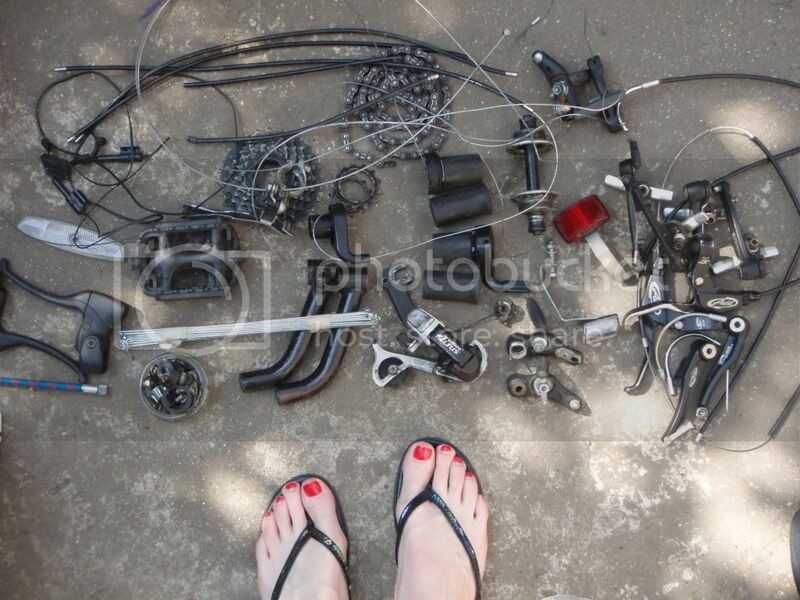 Bits and piece here, I've scrapped a couple of bike in my time and hoarded the parts! Now I need the room, what do you reckon should be junked? Looks like the start of a nice well-stocked parts bin to me. Pretty much all stuff I'd keep, except maybe the single flat pedal (is there a story there?). If you just stuff it all in a suitably-sized cardboard box, will it really take that much space? The other pedal is under the other pedal! And your quite right, it won't. Just needs a sturdier box I suppose! The last one fell apart! I'm loathed to throw stuff away but I thought hey ho, needs to be done. I thought I'd get the support I need to junk it. And well, you've just failed! I would probably junk the cable inners, but keep the rest (but I would keep just one inner, they are useful for poking stuff with). You can guarantee that if you junked everything, within 48 hours you would think "I will just fit X to the Y bike, sh*t no I can't, I junked it"
Personally, I'd junk the cable inners (liable to be knackered anyway) and any suspect-looking outer cable, as well as anything remotely sprocket-shaped unless it's a singlespeed freewheel or fixed sprocket. And the chain, unless its new. Cable inners? You mean the cables!! The cable sleeves (outers) look to be in decent nick so should be worth keeping. Bin the cantis, the plastic brake levers, the incomplete wheel reflector and the hub (you're never going to build it up). The plastic grip shifters probably aren't the worth the space they take up either. ...what do you reckon should be junked? But if something has to go...... If well-worn: the sprockets, chain, hub and pedals. I would also junk the wheel reflector, but only because I don't like them! I'd use the chain to keep a saddle secure. But I would keep the lot as I know they could help keep someone n the road.